The form/reservation included at the end of the link above must be received by postal mail no later than 23 January 2015. The Maryland Federation of NARFE Chapters will conduct its 42nd State Convention Sunday evening, April 26 through Tuesday, April 28, 2015, at the Carousel Resort Hotel in Ocean City, Maryland. The return to Ocean City and to a 2-day format was determined by a vote of the Federation Board and will give attendees an opportunity to fully realize the objectives of the Convention. Special discount rates have been obtained from the recently renovated and enhanced Carousel Resort Hotel to allow participants to fully enjoy the facility while fulfilling their responsibilities. The purpose of the biennial Convention is to elect officers for the next two years, to discuss resolutions germane to the Federation, and to exchange views with senior Federal and Maryland State officials on issues related to the protection and enhancement of current and retired Federal employees’ earned benefits. In addition, there will be workshops on legislative and membership issues. There will also be a reception on Sunday evening, two luncheons with speakers, and a banquet with a live band on Monday. We are inviting excellent speakers to present topics of current interest to members and expect lively discussions on innovations that can help the Federation excel. The Maryland Federation Legislative Committee Advocacy Team (LCAT) Leaders collaborated with NARFE’s National Legislative Department’s Grassroots Program Manager, Sarah Weissmann, for their first training on December 8, 2014. 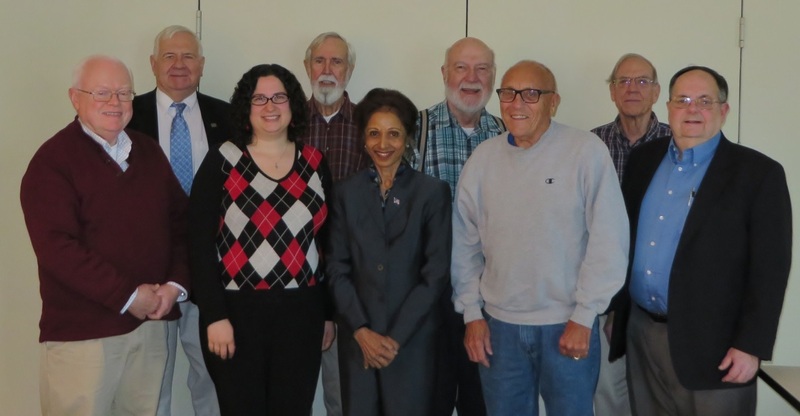 Half of the LCAT comprises of Maryland Federation’s Legislative Committee Representatives and the other half are Maryland Federation Chapter leaders. During the training the LCAT leaders were joined by Maryland Federation Executive Board members and Chairs. NARFE National Headquarters views the LCAT leaders as Liaisons to Maryland Federation’s Chapters and to Maryland Congressional Lawmakers and their Offices. During the training, National Grassroots Program Manager Sarah Weissmann provided a plethora of resources that she has made available for successful grassroots advocacy. As Liaisons, LCAT Leaders will keep Maryland Federation members informed, and working through Chapter Legislative Officers, will be available to train members when appropriate. As Congressional Liaisons, LCAT Leaders will be resources to Chapters, coordinate and participate in Congressional lawmakers’ meetings, and help Chapters continue to build relationships with our lawmakers. NARFE Headquarters has in the past and will continue to collaborate with LCAT Leaders in community involvement, public events, and fundraisers. LCAT Leaders are preparing for the Maryland Federation’s Crusade to Capitol Hill on March 17, 2015. From March 14-17, LCAT Leaders will participate in the NARFE National Legislative Training Conference, from where they will lead the Crusade to our Lawmakers on Capitol Hill. LCAT Leaders will be calling on Chapter leaders to work together and join forces for our productive Maryland Federation’s Legislative Advocacy Crusade on March 17, 2015, and for the rest of the year.